Brother Juniper was a Franciscan monk who, in 1714, happened to be a witness to the collapse of a bridge in Peru, when five people plunged to their deaths. He wondered why such a calamity should have happened to those five: “If there were any plan in the universe at all, if there were any pattern in human life, surely it could be discovered mysteriously latent in those lives so suddenly cut off. Either we live by accident and die by accident, or we live by plan and die by plan. And on that instant Brother Juniper made the resolve to enquire into the secret lives of those five persons that moment falling through the air." It seemed to him that “this collapse of the bridge was “a sheer Act of God. It afforded a perfect laboratory" for discovering God's intention. "Thus it was that the determination rose within him at the moment of the accident. It prompted him to busy himself for six years, knocking at all the doors in Lima, asking thousands of questions, filling scores of notebooks, in his efforts at establishing the fact that each of the five lost lives was a perfect whole. The result of of all this diligence was an enormous book which was condemned as heretical and "publicly burned on a beautiful spring morning in the great square. But there was a secret copy, and after a great many years and without much notice it found its way to the library of the University of San Martin. There it lies between two great wooden covers collecting dust in a cupboard." And Brother Juniper himself was burnt to death at the stake. 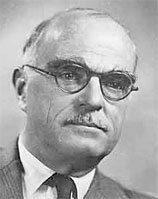 Thornton Wilder (1897-1975) was born in Wisconsin, USA, and spent some two and a half years of his early life in Shanghai, where his father was Consul General. He returned to California, graduated from Yale, and then spent a year at the American Academy in Rome. 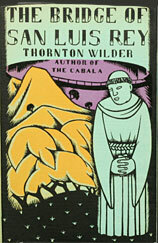 From this experience came his first novel, The Cabala, published in 1926. He taught French, became a housemaster at Lawrenceville School, a boys' preparatory school in New Jersey, and for six years taught English at the University of Chicago. During the war he worked in the intelligence branch of the US Army Air Force and served in North Africa and Italy. In 1950-51 he held the post of C E Norton Professor at Harvard. It was the publication of The Bridge of San Luis Rey in 1927 which won him a Pulitzer Prize and established him as a leading novelist. As well as novels, he wrote such plays as Our Town (1938) and The Skin of our Teeth (1944) which were both awarded Pulitzer Prizes. He explained that the idea for The Bridge of San Luis Rey came from friendly arguments with his father, who was a strict Calvinist and saw disaster as a punishment for sin. But what about God's love? Wilder used his novel to querstion this - but it was not a question to which he could offer any easy answer. His brother, by the way, was Professor of Divinity at the Harvard Divinity School. 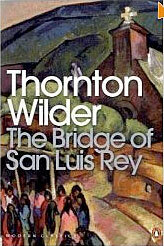 The Bridge of San Luis Rey starts on July 20, 1714, with the collapse of an ancient bridge over a gorge in Peru. Five inter-related people are hurled to their death in the abyss. It seems a meaningless human tragedy. But one witness, Brother Juniper, a Franciscan monk, believes the deaths may not be as random as they appear. Convinced that the disaster is a punishment sent from heaven, the monk sets out to discover all he can about the travellers. The five strangers were connected in some way, he thinks. There must be a purpose behind their deaths. Could it be that the lost lives were the result of sin - or perhaps of love? Unfortunately, as far as any claim to be a clerical detective is involved, we're not really told anything at all about Brother Juniper's investigations as the story is told, not by him, but by an anonymous present-day narrator whio can, he says, tell us more than Brother Juniper was ever able to discover. For as well as Juniper's book, the narrator also has access to the letters (which had become "one of the great monuments to Spanish literature) written by the Marquesa de Montemayor. The book holds the interest throughout and is a major achievement. It asks more questions than it answers but, even if Juniper only just qualifies as a clerical dertective, it is certainly to be recommended. There are various mentions of the author and his work on the web, but particularly see the Thornton Wilder Society site. The book has come out in numerous editions, and there is quite a contrast in style beween the first edition (top photo) and later ones.